Buy the Latest Black Donnelly’s Merchandise! It’s not just a Beer, it’s a Story! 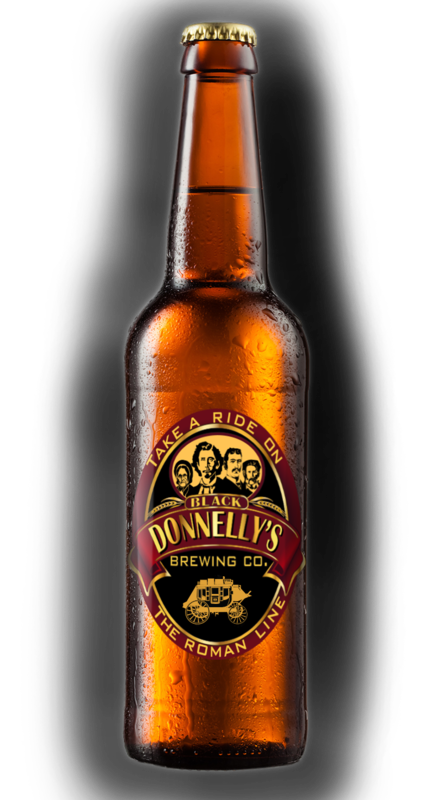 Black Donnelly’s Brewing Company is an Ontario craft brewery. Our exceptional craft beer comes with one of the most infamous stories of Canada’s early frontier. Our microbrewery produces a crisp, refreshing lager that’s perfect for a pint after work, a couple rounds on the patio, or your St. Patty’s Day party. Black Donnelly’s takes its name from one of Canada’s most controversial families. With seven sons and fighting spirit, the Donnelly family was a force to be reckoned with. Those who crossed them came away bruised and beaten, if they were lucky. One cold winter night in 1880, their feud boiled over, and a vigilante gang massacred much of the Donnelly family. The violence was so dramatic, people have people have been telling the Black Donnelly story ever since. Now, our craft beer continues the Donnelly story. You can find our Roman Line lager in fine establishments across south-western Ontario. Check out our Find Us page for the location nearest you! Roman Line Lager is brewed in a traditional style using all-natural ingredients. It’s bright flavour of apricot, spice, lemon, with floral undertones make a crisp golden Lager that you’ll enjoy anytime, any season. The initial hint of hops disappears briskly to encourage another taste. Not only is the beer all-natural and unpasteurized, it tastes great too! Our Growlers are ready for any Southwestern Ontario Licensed Establishment to sample our Lager. Try our Dark Horse Ale! Introducing our new Dark Horse Ale. It’s a clean, refreshing, traditional ale at 5% Alcohol. With a slightly malty finish, we are sure you will enjoy. Copyright © 2015 Black Donnelly's Brewing Co. All Rights Reserved.